You’re a little mouse and you have only one thing in mind : acquire the delicious cheese and bring it back to the hole. In order to help you, a player will be chosen to be the powerful shaman and will be able to spawn different objects to guide you. Buy some items in the shop to personalize your mouse. Use the arrow keys or WASD to move your mouse, press Up or W to jump. Wooden / Grass / Earth / Snow / Stone grounds – Wood ground is the basic ground of the game. Grass, earth, snow and stone grounds share similar properties with wood ground but have a different look; their purpose is to be decorative grounds. Sand ground – This ground has a little less friction than wooden, grass, earth, and stone grounds. It’s harder for mice to grip to this ground and climb it. Ice ground – This ground has way less friction than wooden, grass, earth, snow and stone grounds. Mice can’t grip to this ground and can’t climb it. Trampoline ground: Mice can bounce on this ground. Lava ground: If you touch lava, cancel your bounce with a jump in order to not fly too high. Otherwise, expect death. Water ground – Mice without cheese can float on the surface of this ground, while the poor mice with cheese on their back will sink like a stone ! The shaman is the mouse who guides all the other mice to the cheese and then to the hole thanks to several objects she can spawn via the menu (link). They also can tie these objects thanks to a variety of anchors with different properties. This way, they can build safe structures on which you’ll be able to run. The shaman has the most important role and players totally depend on them. They are often indispensable on your quest to the cheese. Click on one item from the list at the bottom right to select it. Click again at the place you want to put it and keep it pressed to summon the chosen item. Most of the items have to be summoned near the shaman. In that case, you’ll see a blue circle around your mouse: it shows you where you can spawn an item (link). Use the scrolling wheel or the Z/Ctrl keys to rotate the object before spawning it; you can also use X or Shift to rotate it the other way. Don’t try to summon any item outside this circle, it’ll turn red and you won’t be able to summon it. Arrow: The arrow allows you to lead mice and shows them where to go. Spirit: The spirit is a little explosion that can be spawned anywhere on the map. It is mainly used to propel mice for short distance. Balloon: The balloon is an object that floats until it comes in contact with an other object. It can be tied to any other objects or mice thanks to the anchors and makes them fly too. Rune: When it’s spawned, the rune will cross the map along the same lines as the arrow until it comes in contact with an other object. In that case, it’ll push it. Runes can be tied to any other objects to push them in accordance with the shaman’s wishes. Little box / Big box: Mice can climb on them. Anvil: The anvil is a really heavy item, it’s mainly use to weigh the other items down to prevent them from moving. Because of its weight, it’s hard for mice to move it. Little plank / Large plank: Mice can climb on planks. Planks are mainly use to build bridges and several other structures to allow mice to obtain the cheese. Ball: A simple ball that bounces. Canon: Canons share the same properties with anvils, the only difference resides in its movement. Cannons are shot in the direction of their arrow and won’t stop until they come in contact with a blocked item. Shamans mainly use them to get rid of useless items or annoying mice. Conjuration: The conjuration is directly spawned without any waiting period and it’s composed of small blue blocks that you draw with your cursor. These blocks disappear after 10 seconds and mice can walk on it. The conjuration is available for only some few maps. Portals: Portals are two items that allow mice to teleport from one to the other one. Mice can go in or out either portal. Anchors allow shaman to tie several spawned objects. The only way to create one of these anchors is to push C, V, B, N or J keys after selecting an item and before summoning it. If you push these keys several times, you’ll also be able to choose the anchor’s position on the item ! – C – Yellow Anchor – This anchor needs to be attached to another item and make this item unable to rotate. It’s mainly used to build bridges and several buildings. – B – Red Anchor – This anchor can be directly attached to the map or to any other item, but it can only be selected with a plank. Items are limited to a single red anchor and can’t be attached to any item that has a red anchor. Its main function is to rotate, and that’s not all! Red anchors have an other nice function: they can be placed on a dynamic item in order to prevent them to move! – V – Blue Anchor – This anchor needs to be attached to another item. It hinges the item. – N and J – Blue Motorized Anchors – These anchors are to be attached to another item. They share the same properties with the blue anchor but the difference resides in the fact they can rotate automatically thanks to their motor. A ghost item is easily recognizable thanks to its transparency and its blue shade. These items work like the cloud ground: mice can go through them but items can’t. Each item can become a ghost item (except spirit, portals and conjuration). To ghost an item, press the spacebar after selecting it from the menu. You’re now a “pro” which means you saved more than 1.000 mice! You know all the in and out about the shaman and you’re certainly looking for some new challenges! The Hard Mode has been made for you! But those aren’t its only features. Hard mode shamans can’t summon any spirit nor use any red anchor anymore! Nonetheless they can create a totem to help them. Click on “Edit your Totem” (link) to create yours ! A totem is a pre-made build that can be summoned once per map. This building can be anything : it can be decorative like this “mouse totem” or more useful like this bridge. Once you saved your totem and once you’re the shaman, you can spawn your totem thanks to this icon. Your mouse will always spawn in a public room, they are easily recognizable since they are numbered room from 1 and tend towards infinity (the number of room adapts with the number of mice playing). Public rooms play vanilla maps (maps created by Tigrounette and numbered from 0 to 137) and maps created by players via the map editor. Vanilla rooms only plays vanilla map (maps created by Tigrounette and numbered from 0 to 137). Each room’s name containing the word “vanilla” will automatically be a vanilla room. For mice more familiar to the game and for mice who learned various complicated techniques, there are also bootcamp rooms! In these rooms, there is no shaman and maps are complicated but still completable alone! Each turn lasts 6 minutes and mice respawn every 15 seconds if they’ve die. Statistics don’t count in bootcamp rooms. /room: This command allows you to switch to a random room. Type /room followed by the room name you want to go in: type /room 10 if you want to go to the room 10 or /room fromage if you want to go to the room fromage. /bootcamp: It works like /room but will send you in a bootcamp room. /vanilla: It works like /room but will send you in a vanilla room. /editor: This command will send you to the map editor. /totem: This command will send you to the totem editor. /w nickname: This command allows you to whisper a message to another mouse. /friend nickname: This command allows you to add “nickname” in your friends list. /profile nickname: This command allows you to see the profile of the player “nickname“. /mute nickname: This command allows you to totaly ignore a player’s messages. You won’t receive any more whispers from him nor will you see him talking in the public chat. /ban nickname: Players have the ability to exclude a player from the game for an hour via the popular vote. This command is taken into consideration if the player is in your room. Warning: any abuse will be punished. /title: This command lists the titles you’ve earned by bringing cheese back or rescuing mice. To choose one of these titles, type /title followed by the number of the title you want. For example if you want the title “Little Mouse” you have to type /title 0. /silence: This command lets you to toggle your whispers. /facebook: This command will open the Transformice’s facebook page in your web browser. It’ll also give you 20 cheese the first time you use it. Vous êtes une souris et vous n’avez qu’une seule idée en tête : attraper ce délicieux fromage et le ramener jusqu’au trou. Pour vous aider, l’un des joueurs sera choisi comme puissante chamane et invoquera divers objets pour vous guider. Acheter des objets dans le magasin pour personnaliser votre souris. Déplacez vous avec les touches Gauche et Droite. Utilisez Haut pour sauter. Vous pouvez également utiliser, si vous le préférez, les touches ZQSD. Bois / Herbe / Terre / Neige / Pierre – Le bois est le sol de base du jeu, les sols herbe, terre, neige et pierre ont des propriétés similaires mais ont un look différent et sont donc là à but décoratif. Sable – Ce sol a un peu moins de friction que les sols bois, herbe, terre et pierre. Il est plus difficile pour les souris d’y grimper mais elles n’y glissent pas totalement pour autant. Glace – Ce sol a beaucoup moins de friction que les sols bois, herbe, terre, neige et pierre. Les souris ne peuvent pas du tout y grimper et glissent lorsqu’elles marchent dessus. Trampoline – Les souris rebondissent sur ce sol. Lave – Si vous touchez de la lave, n’oubliez pas de sauter afin de ne pas voler trop haut. Dans le cas contraire, attendez vous à mourir. Eau – Les souris sans fromage peuvent flotter à la surface de ce sol, quant à celles qui en portent un sur le dos … elles couleront à pic ! La chamane est la souris qui guide toutes les autres souris jusqu’au fromage puis jusqu’au trou grâce à divers objets qu’elle peut invoquer depuis le menu (lien) et qu’elle peut lier entre-eux via divers clous aux propriétés différentes. Elle construit ainsi divers structures les plus sûres possible sur lesquelles vous pourrez courir. La chamane a le rôle le plus important étant donné les joueurs dépendent entièrement d’elle. Elle est souvent indispensable dans votre quête du fromage ! Cliquez sur un objet de la liste en bas à droite pour le sélectionner. Cliquez (clic gauche) ensuite à l’endroit où vous voulez le placer et maintenez appuyé pour invoquer l’objet. La plupart des objets ne peuvent être invoqués qu’à proximité de votre souris. Lorsque ce sera le cas, vous verrez un cercle bleu autour de votre souris, vous indiquant où vous pouvez invoquer (lien). Utilisez la molette ou les touches Ctrl/Shift/X pour faire pivoter un objet avant de l’invoquer. 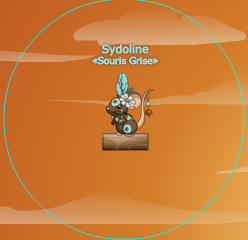 N’essayez alors pas d’invoquer en dehors de ce cercle, l’objet deviendra rouge et l’invocation sera tout simplement impossible ! Flèche : La flèche vous permet de diriger les souris en leur indiquant où aller. Esprit : L’esprit est une petite explosion qui peut être crée partout sur la map. L’esprit est couramment utilisé afin de propulser les souris sur de courtes distances. Ballon : Le ballon est un objet qui vole jusqu’à ce qu’il rencontre un autre objet. Il peut être attaché à d’autres objets ou souris via les clous afin de les faire voler également. Rune : Lorsqu’elle est invoquée, la rune traverse la carte dans le sens de la flèche jusqu’à ce qu’elle entre en contact avec un autre objet. Lorsqu’une rune touche un objet, elle va alors le pousser. Les runes peuvent être clouées à un objet pour le pousser selon les désirs de la chamane. Petite caisse / Grande caisse : Les souris peuvent grimper sur ces deux caisses. Enclume : L’enclume est un objet qui pèse très lourd et qui est souvent utilisé pour alourdir les objets et les empêcher de bouger. À cause de son poids, il est très difficile pour les souris de la déplacer. Petite planche / Grande planche : Les souris peuvent grimper sur ces deux planches. Les planches peuvent être attachées ensemble pour construire divers ponts et autres structures permettant aux souris d’accéder au fromage. Balle : Une simple petite balle qui rebondit. Canon : Les canons sont des objets qui pèsent aussi lourds qu’une enclume mais qui sont en mouvement. Ils servent généralement à se débarrasser des objets inutiles qui trainent sur la carte ou des souris qui refusent d’entrer dans le trou. Conjuration : La conjuration est invoquée directement sans temps d’attente et elle est composée de blocs bleus qui apparaissent là où se trouve la souris. Ces blocs disparaissent après 10 secondes et les souris peuvent marcher dessus. La conjuration n’est disponible que sur certaines cartes. Portails : Les portails sont deux objets qui permettent aux souris de se téléporter de l’un à l’autre. Bien qu’ils existent en deux variantes (bleu et orange), les deux peuvent être utilisés comme entrée et sortie. Les clous permettent à la chamane de lier divers objets qu’elle a invoqués entre eux. La seule et unique façon de créer l’un de ces clous est d’appuyer sur C, V, B, N et J après avoir sélectionné l’objet à invoquer et avant l’invocation. Si vous appuyez plusieurs fois, vous pourrez également choisir la position du clou sur l’objet ! Il existe 4 types de clous différents avec pour chacun d’eux une utilisation bien spécifique. – C – Clou Jaune – Le clou jaune est obligatoirement attaché à un autre objet et rend l’objet incapable de pivoter. Ce clou sert généralement d’attache pour divers ponts et constructions. – B – Clou Rouge – Le clou rouge peut être accroché directement sur la carte ou sur un objet, mais ce clou ne peut être sélectionné qu’avec une planche. Ce clou est limité à un seul clou rouge par objet et ne peut pas être lié à un autre objet qui a déjà un clou rouge. La fonction première des clous rouges est de pouvoir pivoter, mais ce n’est pas tout ! Les clous rouges ont une autre fonction sympathique ! Ils peuvent être placés sur un objet dynamique afin de ne plus le faire bouger. - V – Clou Bleu – Le clou bleu est obligatoirement attaché à un autre objet, l’objet alors accroché peut pivoter tout en étant lié à l’objet. – N et J – Clou Moteur Bleu – Ces clous sont obligatoirement liés à un autre objet. Ils ont la même particularité que le clou bleu mais la grande différence réside dans le fait qu’ils pivotent tout seul grâce à leur moteur (dans le sens indiqué par la flèche). Un objet fantôme est reconnaissable de part sa transparence et sa couleur bleutée. Ces objets fonctionnent comme le sol nuage vu précédemment : les souris peuvent passer en travers mais les objets ne peuvent pas. Tous les objets sauf l’esprit, les portails et la conjuration peuvent devenir des objets fantômes. Pour rendre un objet “fantôme”, appuyez sur la barre espace après l’avoir sélectionné dans le menu. Vous êtes devenus ce qu’on appelle des “pros”, c’est à dire des personnes qui ont sauvées plus de 1.000 souris ! Vous connaissez donc toutes les astuces concernant la chamane et vous êtes à la recherche de nouveaux challenges ! Le mode chamane difficile est donc fait pour vous ! Mais ce n’est pas la seule caractéristique de ce mode. Les chamanes en mode difficile ne peuvent ni invoquer d’esprit ni utiliser de clou rouge ! Néanmoins pour les aider, elles peuvent se créer un totem via cette même fenêtre en cliquant sur “Modifier votre Totem” (lien). Un totem est une structure toute prête qui peut être invoquée une fois par carte afin d’aider la chamane difficile. Cette structure peut être tout et n’importe quoi : elle peut être décorative comme les totems en forme de souris ou plus utile comme un pont. Une fois en jeu et lors de votre tour en tant que chamane, vous pouvez invoquez votre totem via cette icône. Après connexion, votre souris se trouvera toujours dans un salon public, ils sont facilement reconnaissables puisqu’il s’agit de salons numérotés de 1 à l’infini (le nombre de salon s’adapte au nombre de joueurs en ligne). Les salons publics jouent des cartes de type vanilla (créées par Tigrounette et numérotées de 1 à 137) et des maps créées par les joueurs via l’éditeur de carte. Les salons vanilla ne jouent que des cartes de type vanilla (créées par Tigrounette et numérotées de 1 à 137). Tout salon comprenant le mot “vanilla” deviendra alors un salon vanilla. Pour les souris les plus habituées au jeu et ayant acquis diverses techniques plus ou moins compliquées, il y a également les salons bootcamp ! Dans ces salons, il n’y a pas de chamane et les cartes sont compliquées mais achevables en solo ! Chaque tour dure 6mn et les souris réapparaissent toutes les 15 secondes en cas de mort. Les statistiques ne changent pas dans ce salon. /bootcamp : Fonctionne comme la commande /salon mais vous enverra dans un salon de type bootcamp ! /vanilla : Fonctionne comme la commande /salon mais vous enverra dans un salon de type vanilla ! /editor : Cette commande vous amène directement dans l’éditeur de carte sans passer par le menu. /totem : Cette commande vous amène directement dans l’éditeur de totem sans passer par le menu. /c pseudo : Cette commande vous permet de chuchoter un message à l’oreille de “pseudo“. /ami pseudo : Cette commande vous permet d’ajouter “pseudo” dans la liste de vos amis. /profil pseudo : Cette commande vous permet de voir le profil du joueur “pseudo“. /mute pseudo : Si vous utilisez cette commande, vous ne recevrez plus de messages de la part du joueur “pseudo“. /ban pseudo : Les joueurs ont la possibilité d’exclure un joueur du jeu pendant une heure via le vote populaire. Cette commande est prise en compte uniquement si le joueur se trouve dans votre salon. Attention, tout abus sera sanctionné. /titre : Cette commande liste les titres que vous avez gagnés en ramenant des fromages ou en sauvant des souris. Pour choisir l’un de ces titres, tapez /titre + le nombre correspondant au titre. Par exemple si je veux le titre “Souris Grise”, je dois taper /titre 0. /silence : Cette commande vous permet d’activer ou de désactiver les chuchotements. 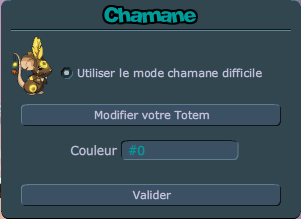 /facebook: Cette commande vous ouvrira la page facebook du jeu Transformice dans votre navigateur. Elle vous rapportera également 20 fromages lors de sa première utilisation. Compre alguns itens na loja para personalizar o seu rato. Use as setas ou WASD para controlar seu rato. Pressione para cima ou W para pular. Madeira / Grama / Terra / Neve / Pedra – O piso de madeira é o piso básico do jogo. Os pisos de grama, terra, neve e pedra compartilham as mesmas propriedades do piso de madeira, mas possuem uma aparência diferente; eles servem como pisos decorativos. Piso de areia – Esse piso tem um pouco menos de fricção que os de madeira, grama, terra, neve e pedra. É mais difícil para os ratos se agarrarem a ele e escalá-lo. Piso de gelo – Esse piso tem bem menos fricção que os de madeira, grama, terra, neve e pedra. Ratos não podem agarra-lo e escalá-lo. Piso de trampolim: Ratos podem rebater nesse piso. Piso de lava: Se você tocar na lava, cancele seu impulso com um pulo para não voar muito alto. Caso contrário, espere a morte. Piso de água – Ratos sem queijo irão flutuar nesse piso, enquanto os que carregam o queijo vão afundar como uma pedra! O shaman é o rato que ajuda todos os outros ratos a chegar ao queijo e depois a toca graças a vários objetos que ele pode invocar pelo menu (link). Eles também podem ligar esses objetos com pregos que possuem diferentes propriedades. Dessa forma, eles podem fazer construções seguras em que você será apto para andar. Os shamans têm o papel mais importante e os jogadores dependem totalmente deles. Geralmente são indispensáveis na sua busca pelo queijo. Clique em um dos itens da lista localizada no canto inferior direito da tela para seleciona-lo. Clique novamente no local que você quer colocar o item e segure o botão para invocá-lo. A maioria dos itens deve ser invocada perto do shaman. Nesse caso, você verá um circulo azul em volta de seu rato: ele indica aonde você será capaz de invocar um item (link). Use a roda de rolagem ou as teclas Z/Ctrl para rodar os objetos antes de invocá-los. Não tente invocar qualquer item fora do círculo azul, ele ficará vermelho e você não será capaz de invocá-lo. Seta: A seta permite que você guie os ratos e mostre aonde eles devem ir. Espírito: O Espírito é uma pequena explosão que pode ser invocada em qualquer lugar do mapa. Ela é usada principalmente para impulsionar os ratos por certa distância. Balão: O balão é um objeto que flutua até que ele entre em contato com outro objeto. Ele pode ser ligado a outros objetos ou a ratos, fazendo eles voarem também. Isso acontece graças aos pregos. Runa: Quando invocada, a runa vai atravessar o mapa ao longo do mesmo caminho até que entre em contato com outro objeto. Nesse caso, a runa irá empurrá-lo. Runas podem ser ligadas a todos os outros objetos para empurrá-los de acordo com o desejo do shaman. Bigorna: A bigorna é um item muito pesado, ela é principalmente usada para pesar outros objetos de forma que previna o movimento deles. Por causa do peso, a bigorna dificilmente é movida pelos ratos. Tábua pequena / Tábua grande: Ratos podem escalar tábuas. Elas são principalmente utilizadas para construção de pontes e várias outras construções que permitam aos ratos pegar o queijo. Bola: Uma simples bola que quica. Bala de canhão: Balas de canhão possuem as mesmas propriedades que as bigornas, a única diferença se encontra na movimentação. São disparadas na direção de suas setas e não irão parar até que atinjam um item bloqueando o caminho. Shamans as usam principalmente para se livrarem de itens inúteis ou de ratos chatos. Conjuração: A conjuração aparece automaticamente quando é utilizada, sem nenhum período de espera, e é composta por pequenos blocos azuis que aparecem por onde o mouse do seu computador passar. Esses blocos irão desaparecer após 10 segundos e os ratos podem andar sobre eles. A conjuração é disponível apenas para alguns mapas. Portais: Portais são dois itens que permitem aos ratos teleportarem de um deles para o outro. Ratos podem entrar ou sair em qualquer um dos portais. Pregos permitem ao shaman ligar vários itens conjurados. O único jeito de criar um desses pregos é apertar as teclas C, V, B, N ou J após selecionar o item e antes de conjurá-lo. Se você apertar essas teclas repetidas vezes, você será capaz de escolher a posição do prego no item! – C – Prego Amarelo – Esse prego precisa ser ligado a outro item e faz com que ele seja incapaz de se rotacionar. É geralmente utilizado na construção de pontes e outras construções. – B – Prego Vermelho – Esse prego pode ser diretamente ligado ao mapa ou a qualquer outro item. Itens possuem um limite de apenas um prego vermelho e não podem ser conectados a outro item que já possua um prego vermelho. Sua principal função é rotacionar, mas isso não é tudo! Pregos vermelhos têm outra boa função: podem ser postos em itens dinâmicos para prevenir que se movam! – V – Prego Azul – Esse prego precisa ser ligado a outro item. Ele funciona como uma dobradiça. – N e J – Pregos Azuis Motorizados – Esses pregos precisam necessariamente ser ligados a outro item. Eles possuem as mesmas propriedades que o prego azul mas com a diferença de que rotacionam automaticamente devido a seus motores. Um item invisível é facilmente reconhecível graças à sua transparência e a sua sombra azulada. Esses itens funcionam como os piso de nuvem: ratos podem atravessá-los, mas itens não. Todo item pode se tornar invisível (com exceção do espírito, dos portais e da conjuração). Para fazer um item invisível, pressione espaço após selecioná-lo no menu. Você agora é um “pro”, o que significa que salvou mais de 1000 ratos! Você sabe tudo sobre ser shaman e certamente está procurando por novos desafios! O Hard Mode foi feito para você! Mas essas não são suas únicas características. 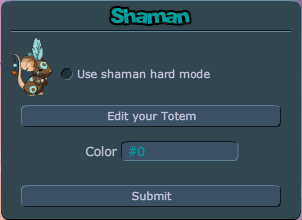 Shamans em hard mode não podem mais conjurar nenhum espírito ou usar nenhum prego vermelho! No entanto, eles podem criar um totem para ajudá-los. Clique em “Edite seu Totem” (link) para criar o seu! Um totem é uma construção já feita que pode ser conjurada uma vez a cada mapa. Essa construção pode ser qualquer coisa: pode ser decorativa, como esse “totem de rato”, ou mais prática, como essa ponte. Uma vez que você tenha salvo seu totem e seja sua vez de ser shaman, você pode conjurá-lo graças a esse item. Seu rato irá sempre começar em uma sala pública, elas são facilmente reconhecíveis uma vez que são numeradas desde o número 1 até o infinito (o número de salas se adapta ao número de ratos jogando). Salas públicas dispõem de mapas vanilla (mapas criados pelo Tigrounette e numerados de 1 a 137) e mapas criados por jogadores através do editor de mapas. Salas vanilla apenas dispõem de mapas vanilla (mapas criados pelo Tigrounette e numerados de 0 a 137). Toda sala que possuir a palavra “vanilla” em seu nome será automaticamente uma sala vanilla. Para ratos mais familiarizados com o jogo e para os ratos que aprenderam várias técnicas complicadas, temos também as salas bootcamp! Nessas salas, não há shaman e os mapas são complicados, mas ainda são capazes de serem completados sem ajuda! Cada turno dura 6 minutos e os ratos voltam a cada 15 segundos, mesmo já tendo morrido. Estatísticas não são contadas em salas bootcamp. /sala: Esse comando permite a você trocar aleatoriamente sua sala. Digite /sala seguido pelo nome da sala que você deseja entrar: digite /sala 10 se você quer ir à sala 10 ou /sala fromage se você quer ir à sala fromage. /bootcamp: Funciona como o /sala, mas o enviará para uma sala bootcamp. /vanilla: Funciona como o /sala, mas o enviará para uma sala vanilla. /editor: Esse comando o enviará para o editor de mapas. /totem: Esse comando o enviará para o editor de totem. /c apelido: Esse comando permite a você mandar um cochicho a um outro rato. /amigo apelido: Esse comando permite que você adicione “apelido” a sua lista de amigos. /perfil apelido: Esse comando permite que você veja o perfil do jogador “apelido“. /mute apelido: Esse comando permite que você ignore completamente as mensagens de outro jogador. Você não receberá mais cochichos desse jogador, nem o verá falando no chat da sala. /ban apelido: Jogadores tem a habilidade de excluir um jogador do jogo por uma hora, através do voto popular. Esse comando é levado em consideração caso o jogador esteja em sua sala. Aviso: qualquer abuso desse comando será punido. /titulo: Esse comando lista os títulos que você já conseguiu coletando queijos ou salvando ratos. Para escolher um desses títulos, digite /titulo seguido pelo número do título que você deseja. Por exemplo, se você quiser o título “Ratinho” você deve digitar /titulo 0. /silence: Esse comando permite que você desative seus cochichos. /facebook: Esse comando irá abrir a página do Transformice do facebook no seu navegador. Irá também lhe dar 20 queijos na primeira vez que você utilizá-lo. Eres un pequeño ratón y sólo tienes una cosa en mente: conseguir el delicioso queso y llevarlo devuelta a la madriguera. Para ayudarte, un jugador será escogido para ser el poderoso chamán y podrá invocar diferentes objetos para guiarte. Comprar objetos en la tienda para personalizar a tu ratón. Usa las flechas o teclas WASD para mover a tu ratón, presiona arriba o W para saltar. Madera / Césped / Tierra / Nieve / Piedra – La madera es el suelo básico del juego. Los suelos de césped, tierra, nieve y piedra comparten propiedades similares con la madera pero tienen una apariencia distinta; su propósito es ser suelos decorativos. Suelo de arena – Este suelo tiene un poco menos de fricción que los suelos de madera, césped, tierra y piedra. Es más difícil para los ratones agarrarse a este suelo y escalarlo. Sueno de hielo – Este suelo tiene mucha menos fricción que los suelos de madera, césped, tierra, nieve y piedra. Los ratones no se pueden agarrar a este suelo ni escalarlo. Suelo de trampolín: Los ratones pueden rebotar en este suelo. Suelo de lava: Si tocas lava, cancela tu rebote con un salto para no volar muy alto, de otra forma, espera morir. Suelo de agua – Los ratones sin queso pueden flotar en la superficie de este suelo, mientras que los pobres ratones con queso se hundirán como una piedra! El chamán es el ratón que guía a los demás ratones al queso y luego a la madriguera gracias a varios objetos que puede invocar desde el menu (link). También puede unir estos objetos gracias a una variedad de anclajes con diferentes propiedades. De esta forma, puede construir estructuras seguras en las que serás capaz de correr. El chamán tiene el rol más importante y los jugadores dependen totalmente de él. A menudo, son indispensables en tu búsqueda al queso. Haz click en un objeto de la lista abajo a la derecha para seleccionarlo. Haz click nuevamente en el lugar que quieres ponerlo y mantenlo presionado para invocar el objeto elegido. La mayoría de los objetos tienen que ser invocados cerca del chamán. En ese caso, verás un círculo azul alrededor de tu ratón: muestra dónde puedes invocar un objeto (link). Usa la rueda de deslizamiento o las teclas de Z/Ctrl para rotar los objetos antes de invocarlos; también puedes usar X o Shift para rotarlos en sentido contrario. No intentes invocar ningún objeto fuera del círculo, se tornará rojo y no podrás invocarlo. Flecha: La flecha te permite guiar a los ratones y mostrarles a donde ir. Espíritu: El espíritu es una pequeña explosión que puede ser invocada en cualquier parte del mapa. Es usada principalmente para propulsar a los ratones en cortas distancias. : Globo: El globo es un objeto que flota hasta que entra en contacto con otro objeto. Puede ser atado a cualquier objeto o ratón y hacerlos volar también gracias a los anclajes. Runa: Cuando es invocada, la runa cruzará el mapa en la misma dirección de la flecha hasta que entre en contacto con cualquier otro objeto. En ese caso, lo empujará. Las runas pueden ser atadas a cualquier objeto para empujarlo. Caja pequeña / Caja grande: Los ratones pueden escalarlas. Yunque: El yunque es un objeto realmente pesado, es usado principalmente para añadir peso a otros objetos para evitar que se muevan. Debido a su peso, es difícil para los ratones moverlo. Tabla pequeña / Tabla grande: Los ratones pueden escalarlas. Las tablas son usadas principalmente para construir puentes y otras estructuras para permitirle a los ratones conseguir el queso. Pelota: Una simple pelota que rebota. Cañón: Los cañones comparten las mismas propiedades que los yunques, la única diferencia está en su movimiento. Los cañones son lanzados en la dirección de su flecha y no se detienen hasta que entran en contacto con un objeto bloqueado. Los chamanes lo usan principalmente para deshacerse de objetos innecesarios o ratones molestos. Conjuración: El conjuro es directamente invocado sin ningún período de espera y está compuesto de pequeños bloques azules que dibujas con tu cursor. Estos bloques desaparecen luego de 10 segundos y los ratones pueden caminar en ellos. La conjuración sólo está disponible en algunos mapas. Portales: Los portales son dos objetos que permiten a los ratones teletransportarse de uno al otro. Los ratones pueden ir dentro o fuera de cualquier portal. Los anclajes permiten a los ratones unir varios objetos invocados. La única forma de crear estos anclajes es presionando las teclas C, V, B, N o J luego de seleccionar un objeto y antes de invocarlo, ¡Si presionas estas teclas varias veces también serás capaz de elegir la posición del anclaje en el objeto! - C – Anclaje amarillo – Este anclaje necesita estar unido a otro objeto y hace a este incapaz de rotar. Es principalmente usado para construir puentes y distintas construcciones. – B – Anclaje rojo – Este anclaje puede ser directamente unido al mapa o a cualquier otro objeto, pero solo puede ser seleccionado con una tabla. Los objetos están limitados a un solo anclaje rojo y no pueden ser unidos a cualquier objeto que tenga otro anclaje rojo. Su función principal es rotar, ¡Y eso no es todo! Los anclajes rojos tienen otra buena función: ¡Pueden ser puestos en un objeto dinámico para evitar que este se mueva! – V – Anclaje azul – Este anclaje necesita ser unido a otro objeto. Este This anchor needs to be attached to another item. Este gira el objeto. – N y J – Anclajes azules motorizados – Estos anclajes deben estar unidos a otro objeto. Comparten las mismas propiedades con los anclajes azules pero la diferencia reside en el hecho de que pueden rotar automáticamente gracias a su motor. Un objeto fantasma es fácilmente reconocible gracias a su transparencia y su tono azul. Estos objetos funcionan como el suelo de nube: los ratones pueden pasar a través de ellos pero los objetos no pueden. Cada objeto puede convertirse en un objeto fantasma (excepto el espíritu, los portales y la conjuración). Para convertir un objeto en fantasma, presiona la barra espaciadora después de seleccionarlo en el menu. ¡Ahora eres un “pro”, lo que significa que salvaste más de 1.000 ratones! Sabes todo sobre ser chamán y estás buscando nuevos desafíos, ¡El modo difícil ha sido hecho para ti! Pero estas no son sus únicas características. ¡Los chamanes con modo difícil no pueden invocar espíritus ni anclajes rojos! Sin embargo pueden crear un tótem para ayudarles. ¡Haz click en “Editar tu tótem” (link) para crear el tuyo! Un tótem es una construcción pre-hecha que puede ser invocada una vez por mapa. Esta construcción puede ser cualquier cosa : puede ser decorativa como esta “tótem de ratón” o más útil como esta puente. Una vez guardado tu tótem y cuando eres chamán, puedes invocarlo gracias a este icono. Tu ratón siempre aparecerá en una sala pública, son fácilmente reconocibles porque están numeradas desde el 1 hasta el inifinito (el número de la sala se adapta con el número de ratones jugando). Las salas públicas juegan mapas vanilla (mapas creados por Tigrounette y numerados del 0 al 137) y mapas creados por usuarios desde el editor de mapas. Salas vanilla solo juegan mapas vanilla (mapas creados por Tigrounette y numerados del 0 al 137). Cada sala que contenga la palabra “vanilla” en su nombre será automáticamente una sala vanilla. Para ratones más familiarizados con el juego y para ratones que aprendieron varias técnicas complicadas, también están las salas bootcamp! En estas salas no hay chamán y los mapas son complicados pero posibles de completar solo. Cada turno dura 6 minutos y los ratones aparecen cada 15 segundos si han muerto. Las estadísticas no cuentan en las salas bootcamp. /sala: Este comando te permite cambiar a una sala al azar. Escribe /sala seguido del nombre de la sala a la que quieres ir: Escribe /sala 10 si quieres ir a la sala 10, o /sala queso si quieres ir a la sala queso. /bootcamp: Funciona como /sala pero te llevará a una sala bootcamp. /vanilla: Funciona como /sala pero te llevará a una sala vanilla. /editor: Este comando te llevará al editor de mapas. /totem: Este comando te llevará al editor de tótem. /c usuario: Este comando te permite susurrarle un mensaje a otro ratón. /perfil usuario: Este comando te permite ver el perfil del jugador “usuario“. /mute usuario: Este comando te permite ignorar los mensajes de un jugador. No recibirás más susurros de él ni verás sus mensajes en el chat público. /ban usuario: Los jugadores tienen la habilidad de excluir a un jugador de la sala por una hora mediante el voto popular. Este comando es tomado en consideración si el jugador está en tu sala. Advertencia: cualquier abuso será sancionado. /titulo: Este comando lista los títulos que has ganado llevando el queso devuelta a la madriguera o rescatando ratones. Para elegir uno de estos títulos, escribe /titulo seguido del número del título que quieres. Por ejemplo, si quieres el título “Ratoncito” tienes que escribir /titulo 0. /silence: Este comando te permite desactivar tus susurros. /facebook: Este comando abrirá la página de facebook de Transformice en tu navegador web. También te da 20 quesos la primera vez que lo usas. Вы – маленькая мышка, у которой только одно на уме: завладеть вкусным кусочком сыра и принести его обратно в норку. Для того, чтобы помочь вам в этом деле, один из игроков станет всемогущим шаманом, который имеет способность создавать различные объекты, чтобы направлять вас. Покупать вещи в магазине для улучшения своей мышки. Создавать карты с помощью редактора карт (одна карта стоит 40 сыра; если вы делаете хорошие и интересные карты, то эта цена может снизиться!). Используйте стрелки или кнопки WASD для передвижения, нажмите стрелочку вверх или кнопку W для прыжка. Песок (Sand) – у этой же платформы более низкое трение, чем у дерева, травы, земли, снега и камня. За неё сложно ухватиться и по ней трудно взбираться. Лёд (Ice) – имеет более низкое трение, чем у дерева, травы, земли, снега и камня. Мыши не могут за него цепляться и взбираться по нему. Батут (Trampoline) - мыши могут отпрыгивать от него. Лава (Lava) – если вы коснулись лавы, то вы можете уменьшить свой отскок с помощью прыжка. В ином случае, вы просто умрёте. Вода (Water) – мыши без сыра могут с лёгкостью плавать в ней, в отличие от своих бедных собратьев с сыром, которые утонут, как камни! Облако (Cloud) – эта платформа особенная! Мыши могут проходить сквозь неё, а вот предметы нет! Шаман это такая мышка, которая направляет остальных к сыру и после к норе, используя несколько объектов, которые она может создавать с помощью шаманского меню ссылка. Используйте колёсико мыши или кнопки Z/Ctrl для вращения объектов (против часовой стрелки) перед размещением на карте; вы также можете использовать X/Shift для вращения их в другую сторону (по часовой стрелке). Не пытайтесь разместить объект вне шаманского круга – в этом случае объект окрасится в красный цвет и вы не сможете разместить его на карте. Стрелка: позволяет вам направлять мышей и указывать, куда им нужно идти. Спирит: это такой маленький взрыв, который можно сделать где угодно на карте. Обычно он используется для перемещения мышей на короткие дистанции. Шарик: он летит до встречи с другим объектом. Вы можете привязать его к мышке или любому объекту, используя крепления. Руна: при размещении на карте руна будет бродить по ней в том направлении, которое вы задали стрелками, пока не столкнётся с другим объектом. В этом случае она начнёт толкать его. Руну можно привязать к объекту для того, чтобы подтолкнуть его в том направлении, в котором этого хочет шаман. Маленькая коробка / Большая коробка: мыши могут взбираться по ним. Наковальня: это очень тяжёлый предмет, который в основном используется для зафиксирования других предметов от их движения. Из-за веса наковальни мышкам очень трудно её сдвинуть. Маленькая палка / Большая палка: мыши могут взбираться по ним. В основном они используются для построения мостов и других конструкций, которые помогают мышкам добраться до сыра. Мячик: простой мячик, который прыгает. Ядро: у ядер такие же свойства, как и у наковален, но отличие состоит в их движении. Ядра имеют траекторию, заданную стрелками, и они не остановятся до тех пор, пока не столкнутся с более сильным предметом. Колдовство: размещается на карте сразу же и создаёт синие блоки, которые вы рисуете с помощью курсора. Мыши могут ходить по ним, но спустя 10 секунд они исчезают. Колдовство доступно только для некоторых карт. Порталы: два предмета, которые позволяют мышам перемещаться между ними. Мыши могут входить или выходить из портала. Крепления дают шаману возможность скреплять объекты. Для создания крепления необходимо нажать кнопку C, V, B, N или J перед размещением объекта на карте. Вы можете выбирать позицию крепления, повторно нажимая кнопку! - кнопка B – Красное крепление - прикрепляется напрямую к карте или объекту, может быть использовано только с палками. На палке может быть только одно красное крепление и такие палки не могут быть прикреплены к тем, у которых уже есть красное крепление. Главная функция заключается во вращении. Но это ещё не всё! У этих креплений есть ещё одна замечательная функция: они могут быть прикреплены к динамическим объектам, чтобы зафиксировать их местоположение! - кнопка V – Голубое крепление - должно быть прикреплено к другому объекту. Оно будет вращаться на нём. - кнопки N и J – Голубые крепления с моторами - могут быть прикреплены к другому объекту. Имеют такие же свойства, как и у простого голубого крепления, но разница заключается в том, что они могут вращаться автоматически благодаря своим моторам. Такие предметы легко распознать – они прозрачны и имеют синее свечение. Работают они так же, как и облако – мыши могут проходить сквозь них, а вот предметы нет. Каждый предмет, описанный выше, может быть прозрачным (исключая спирит, порталы и колдовство). Для того, чтобы создать прозрачный предмет, нажмите кнопку «пробел» до его размещения на карте. Теперь вы «про»! Это значит, что вы спасли 1000 мышек! Вы знаете о шаманстве всё вдоль и поперёк и теперь вы жаждите больше сложностей! Сложный режим был сделан именно для вас! Нажмите на перо, которое находится на игровом меню (ссылка), и выберите «Сложный режим» (ссылка). Первое, что вы заметите, это изменение облика вашего шамана! Ваши шаманские татуировки окрасятся в золотой цвет, но вы также можете изменить их цвет всё в том же окне (ссылка). Но это ещё не все особенности данного режима. Шаманы, включившие этот режим, больше не могут использовать спирит и красные крепления! Но зато они могут создавать тотемы. Нажмите на «Изменить тотем» (ссылка) для его создания! При заходе в игру ваша мышь всегда будет попадать в публичную комнату. Такие комнаты легко распознать по номеру – они пронумерованы от 1 до бесконечности. В публичных комнатах проигрываются как vanilla-карты (карты, созданные Tigrounette, и имеющие нумерацию от нуля до 137), так и карты обычных игроков, сделанные при помощи редактора карт. В комнатах vanilla проигрываются только vanilla-карты (карты, созданные Tigrounette, и имеющие нумерацию от нуля до 137). Каждая комната, которая имеет в названии слово «vanilla», автоматически становится vanilla-комнатой. Для мышей, которые уже хорошо познакомились с игрой и выучили разные техники, существуют bootcamp-комнаты! В этих комнатах нет шаманов и все карты проходятся в одиночку! На прохождение одной карты даётся 6 минут, а мыши, которые умерли при её прохождении, возрождаются через 15 секунд. Стастика собранных сыров и полученных первых мест не записывается в таких комнатах. /room: перемещает вас в случайную комнату. Введите /room и название желаемой комнаты, чтобы перейти в неё – например, чтобы перейти в комнату 10, введите /room 10; или же /room fromage, если хотите попасть в эту комнату. /bootcamp: работает аналогично команде /room, но перемещает вас в bootcamp-комнату. /vanilla: работает аналогично команде /room, но перемещает вас в vanilla-комнату. /editor: перемещает вас в редактор карт. /totem: перемещает вас в редактор тотема. /w имя: позволяет отправить личное сообщение выбранному игроку. /friend имя: позволяет добавить выбранного игрока в список друзей. /profile имя: позволяет просмотреть профиль выбранного игрока. mute имя: позволяет игнорировать выбранного игрока. Вы больше не увидете сообщения этого игрока в публичном чате и не получите от него личные сообщения. ban имя: у игроков есть возможность исключать кого-либо из комнаты на час с помощью пользовательского голосования (пользовательского бана). Эта команда работает лишь в том случае, если выбранные игрок находится в комнате. Предупреждение: вы можете быть наказаны за злоупотребление этой командой. /title: показывает список всех полученных вами титулов как за собранный сыр, так и за спасённых мышек. Для выбора одного из титулов, введите /title и номер желаемого титула. Например, если вы хотите использовать титул «Маленькая мышь», введите /title 0. /silence: позволяет отключать (и затем обратно включать) ваши личные сообщения. 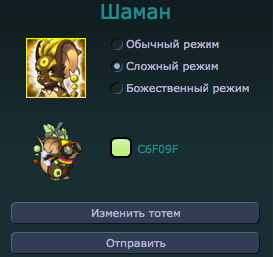 /facebook: открывает страницу игры Transformice на Facebook, а также даёт 20 единиц сыра в магазин (но лишь один раз! ).